Students - This simple poem is offers my thoughts about yesterday. I adore Thanksgiving, and here, on the day after Thanksgiving, I am still so full of gratitude for family, for good friends in my daily life and far away and here in Poetry Friday land. The holiday season ahead of us is one filled with excitement and goodness. I am excited to make a gingerbread house, to decorate, to fold more stars for our windows, and to make sweet and spicy walnuts. But right now, and in many small pauses throughout the month, I plan to stop. Stop to look around at the simple beauties before me. Stop to feel thankful. Stop to write about the small surprising things that make life grand. 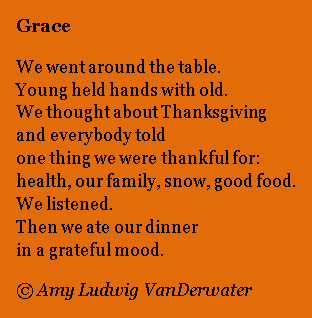 This poem just tells of a normal everyday part of our family's life - dinner grace. But yesterday, somehow, it felt different, perhaps because there were more of us around the table, perhaps because I am more aware that life does not always stay the same. It is important that I feel thankful now for now. What are you thankful for? Big things and small things...they all count. And you know what? Each one of the things on your list could inspire some writing. 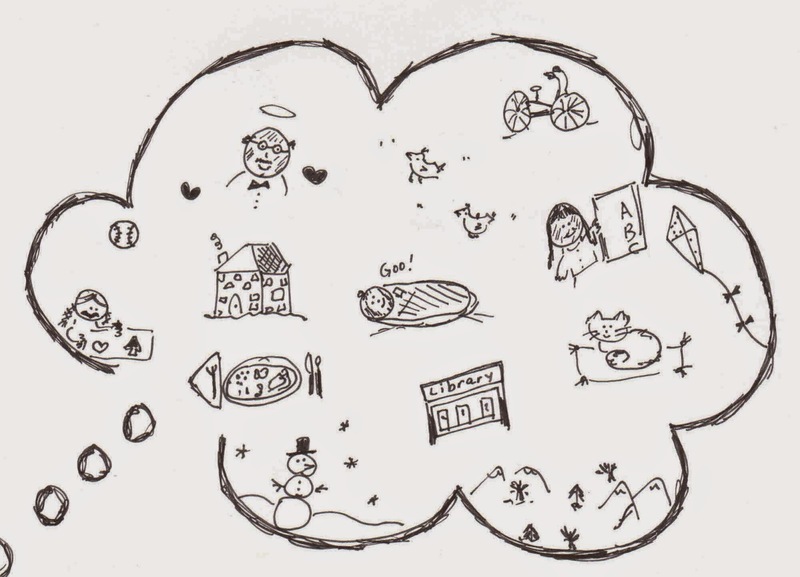 That's where I will continue in my notebook later today. Over at my other blog, Sharing Our Notebooks, you can learn the winners of this month's books! Carol is hosting today's Poetry Friday roundup over at Carol's Corner. Visit her place to find poetry and good poetry people. I am thankful for YOU and all the other Poetry Friday and blogger friends i got to spend time with at NCTE! You make your sweet-spiced walnuts and think of me making graham cracker toffee and peanut clusters. Amy, I love this simple reflection of an important moment from your day. I'm so glad I got to see you at NCTE. I love the reminder to stop during the busyness of the season to look around, feel thankful, and write! Mary Lee beat me to this, but I'll say it anyway. I am grateful for You, too! You are such a gift to the world, to me, to Emily. I love this community of writers. My heart is full after the magical time at NCTE. Simple, yet heavy with love. It was so great to see you, even if just for a moment, at NCTE! Always love what you have to share here. We are all grateful. "perhaps because I am more aware that life does not always stay the same. It is important that I feel thankful now for now." -- yes. I'm thankful for family. And when I think about the last few years, I'm thankful for the wonderful online friends I have made with our shared interest in writing.